We are unlikely to be active in the near future. Please check Vegan Engagements in late 2018. You can use VegEvents.com in the meantime. The Current Events listings for vegetarian (or related) events around here (Los Angeles for now) are one of our main features. Educational Events: We have used video projection. to persuade the masses to stop / reduce their meat consumption. We will be expanding our educational efforts soon. Potlucks: Delicious home cooked (or store bought) vegan foods (no animal products (no flesh, no dairy, no poultry)) is shared. Usually a long evening get together with a short informational video. Restaurant Outings: Visits to various Vegetarian (or Vegetarian friendly) restaurants. Miscellaneous:The club can work on any issue related to vegetarianism (if there is sufficient interest). Example:- The list of local vegetarian restaurants. Check Current Events for details on SoCalVeg affiliated current events as well as other relevant events. CANCELLED 23-Apr-2011 Vegan potluck in Northridge cancelled. Sorry for any inconvenience. 22-Jan-2011 (Sat) 6PM to 10PM: Vegan potluck in Northridge (San Fernando Valley). 25-Dec-2010 (Sat) 6PM to 10PM: Vegan potluck in Northridge (San Fernando Valley). 27-Nov-2010 (Sat) 6PM to 10PM: Vegan potluck in Northridge (San Fernando Valley). 23-Oct-2010 (Sat) 6PM to 10PM: Vegan potluck in Northridge (San Fernando Valley). 02-Oct-2010 (Sat): Vegan Potluck in Manhattan Beach (South Bay) from 6:30PM to 10PM. 25-Sep-2010 (Sat) 6PM to 10PM: Vegan potluck in Northridge (San Fernando Valley). 28-Aug-2010 (Sat) 6PM to 10PM: Vegan potluck in Northridge (San Fernando Valley). 24-Jul-2010 (Sat) 6PM to 10PM: Vegan potluck in Northridge (San Fernando Valley). 26-Jun-2010 (Sat) 6PM to 10PM: Vegan potluck in Northridge (San Fernando Valley). 22-May-2010 (Sat) 6PM to 10PM: Vegan potluck in Northridge (San Fernando Valley). 24-Apr-2010 (Sat) 6PM to 10PM: Vegan potluck in Northridge (San Fernando Valley). 27-Mar-2010 (Sat) 6PM to 10PM: Vegan potluck in Northridge (San Fernando Valley). 06-Mar-2010 (Sat): Vegan Potluck in Manhattan Beach (South Bay) from 6:30PM to 10PM. 27-Feb-2010 (Sat) 6PM to 10PM: Vegan potluck in Northridge (San Fernando Valley). 23-Jan-2010 (Sat) 6PM to 10PM: Vegan potluck in Northridge (San Fernando Valley). 02-Jan-2010 (Sat): Vegan Potluck in Manhattan Beach (South Bay) from 6:30PM to 10PM. 31-Dec-2009 (Thu) 8PM to 1AM: New Year's Welcoming in Northridge. 26-Dec-2009 (Sat) 6PM to 10PM: Vegan potluck in Northridge (San Fernando Valley). 28-Nov-2009 (Sat): Vegan potluck in Northridge (San Fernando Valley) from 6PM to 10PM. 07-Nov-2009 (Sat): Vegan Potluck in Manhattan Beach (South Bay) from 6:30PM to 10PM. 24-Oct-2009 (Sat): Vegan potluck in Northridge (San Fernando Valley) from 6PM to 10PM. 26-Sep-2009 (Sat): Vegan potluck in Northridge (San Fernando Valley) from 6PM to 10PM. 05-Sep-2009 (Sat): Vegan Potluck in Manhattan Beach (South Bay) from 6:30PM to 10PM. 22-Aug-2009 (Sat): Vegan potluck in Northridge (San Fernando Valley) from 6PM to 10PM. 25-Jul-2009 (Sat): Vegan potluck in Northridge (San Fernando Valley) from 6PM to 10PM. 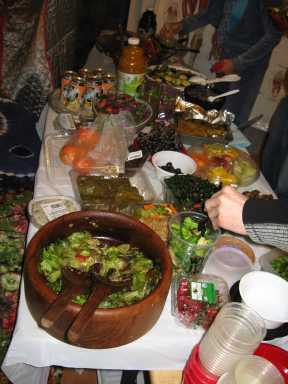 11-Jul-2009 (Sat): Vegan Potluck in Manhattan Beach (South Bay) from 6:30PM to 10PM. 27-Jun-2009 (Sat): Vegan potluck in Canoga Park (San Fernando Valley) from 6PM to 10PM. 23-May-2009 (Sat): Vegan potluck in Northridge (San Fernando Valley) from 6PM to 10PM. 02-May-2009 (Sat): Vegan Potluck in Manhattan Beach (South Bay) from 6:30PM to 10PM. 25-Apr-2009 (Sat): Vegan potluck in Northridge (San Fernando Valley) from 6PM to 10PM (or later). 04-Apr-2009 (Sat): Vegan Potluck in Manhattan Beach (South Bay) from 6:30PM to 10PM. 28-Mar-2009 (Sat): Vegan potluck in Northridge (San Fernando Valley) from 6PM to 10PM (or later). 07-Mar-2009 (Sat): Vegan Potluck in Manhattan Beach (South Bay) from 6:30PM to 10PM. 28-Feb-2009 (Sat): Vegan potluck in Northridge (San Fernando Valley) from 6PM to 10PM (or later). 22-Nov-2008 (Sat): Vegan potluck in Northridge (San Fernando Valley) from 6PM to 10PM (or later). 25-Oct-2008 (Sat): Vegan potluck in Northridge (San Fernando Valley) from 6PM to 10PM (or later). 04-Oct-2008 (Sat): Vegan Potluck in Manhattan Beach (South Bay) from 6:30PM to 10PM. 23-Aug-2008 (Sat): Vegan potluck in Northridge (San Fernando Valley) from 6PM to 10PM (or later). 02-Aug-2008 (Sat): Vegan Potluck in Manhattan Beach (South Bay) from 6:30PM to 10PM. 26-Jul-2008 (Sat): Vegan potluck in Northridge (San Fernando Valley) from 6PM to 10PM (or later). 21-Jun-2008 (Sat): Vegan potluck in Winnetka (San Fernando Valley)from 6PM to 10PM. 07-Jun-2008 (Sat): Vegan Potluck in Manhattan Beach (South Bay) from 6:30PM to 10PM. 24-May-2008 (Sat): Vegan potluck in North Hollywood(San Fernando Valley) from 6PM to 10PM. 26-Apr-2008 (Sat): Vegan potluck in Northridge (San Fernando Valley) from 6PM to 10PM (or later). 05-Apr-2008 (Sat): Vegan Potluck in Manhattan Beach (South Bay) from 6:30PM to 10PM. 22-Mar-2008 (Sat): Vegan potluck in Northridge (San Fernando Valley) from 6PM to 10PM (or later). 23-Feb-2008 (Sat): Vegan potluck in Northridge (San Fernando Valley) from 6PM to 10PM (or later). 02-Feb-2008 (Sat): Vegan Potluck in Manhattan Beach (South Bay) from 6:30PM to 10PM. 26-Jan-2008 (Mon): New Year welcoming in Northridge from 8PM to 1AM. 06-Jan-2008 (Sun) 4PM to 8PM: Vegan Potluck and movie Los Angeles. 31-Dec-2007 (Mon): New Year welcoming in Northridge from 8PM to 1AM. 22-Dec-2007 (Sat): Vegan potluck in North Hollywood from 6PM to 10PM. 01-Dec-2007 (Sat): Vegan Potluck in Manhattan Beach (South Bay) from 6:30PM to 10PM. 24-Nov-2007 (Sat): Vegan potluck in Northridge (San Fernando Valley) from 6PM to 10PM (or later). 22-Nov-2007 (Thu): Promoted and assisted with the non-affiliated Vegan Thanksgiving Picnic at Rancho Park from 11AM to 3PM. 27-Oct-2007 (Sat): Vegan potluck in Northridge (San Fernando Valley) from 6PM to 10PM (or later). 06-Oct-2007 (Sat): Vegan Potluck in Manhattan Beach (South Bay) from 6:30PM to 10PM. 29-Sep-2007 (Sat): Vegan Potluck and Movie in Los Angeles from 6PM to 10PM. 22-Sep-2007 (Sat): Vegan potluck in North Hollywood from 6PM to 10PM. 25-Aug-2007 (Sat): Vegan potluck in Northridge (San Fernando Valley) from 6PM to 10PM (or later). 04-Aug-2007 (Sat): Vegan Potluck in Manhattan Beach (South Bay) from 6:30PM to 10PM. 26-May-2007 (Sat): Vegan potluck in Northridge from 6PM to 10PM (or later). 28-Jul-2007 (Sat): Vegan potluck in Northridge (San Fernando Valley) from 6PM to 10PM (or later). 23-Jun-2007 (Sat): Vegan potluck in North Hollywood from 6PM to 10PM. 16-Jun-2007 (Sat): Vegan potluck in Manhattan Beach from 6:30PM to 10PM. 28-Apr-2007 (Sat): Vegan potluck in Northridge from 6PM to 10PM (or later). 07-Apr-2007 (Sat): Vegan potluck in Manhattan Beach from 6:30PM to 10PM. 24-Mar-2007 (Sat): Vegan potluck in Northridge from 6PM to 10PM (or later). 03-Mar-2007 (Sat): Vegan potluck in Los Angeles (Palms neighborhood) from 6PM to 10PM. 24-Feb-2007 (Sat): Vegan potluck in Northridge from 6PM to 10PM (or later). 03-Feb-2007 (Sat): Vegan potluck in Manhattan Beach from 6:30PM to 10PM. 27-Jan-2007 (Sat): Vegan potluck and tangerine picking party in North Hollywood from 6PM to 10PM. 20-Jan-2007 (Sat): Vegan potluck in Los Angeles (Palms neighborhood) from 6PM to 10PM. 31-Dec-2006 (Sun): New Year welcoming in Northridge from 8PM to 1AM. 23-Dec-2006 (Sat): Vegan potluck in Northridge from 6PM to 10PM (or later). 16-Dec-2006 (Sat): Vegan potluck in Manhattan Beach from 6:30PM to 10PM. 02-Dec-2006 (Sat): Vegan Potluck and cross-dressing party in Los Angeles (Palms neighborhood) from 6PM to 10PM. 25-Nov-2006 (Sat): Vegan potluck in Northridge from 6PM to 10PM (or later). 23-Nov-2006 (Thu): Vegan Thanksgiving Picnic at Rancho Park from 11AM to 3PM. 28-Oct-2006 (Sat): Vegan potluck in Northridge from 6PM to 10PM (or later). 21-Oct-2006 (Sat): Vegan potluck in Manhattan Beach from 6:30PM to 10PM. 30-Sep-2006 (Sat): Vegan potluck in Los Angeles (Palms neighborhood) from 6PM to 10PM. 23-Sep-2006 (Sat): Vegan potluck in Northridge from 6PM to 10PM (or later). 09-Sep-2006 (Sat): Vegan potluck in Manhattan Beach from 6:30PM to 10PM. 26-Aug-2006 (Sat): Vegan potluck in Northridge from 6PM to 10PM (or later). 05-Aug-2006 (Sat): Vegan potluck in Los Angeles (Palms neighborhood) from 6PM to 10PM. 22-Jul-2006 (Sat): Vegan potluck in Northridge from 6PM to 10PM (or later). 15-Jul-2006 (Sat): Vegan potluck in Manhattan Beach from 6:30PM to 10PM. 24-Jun-2006 (Sat): Vegan potluck in Northridge from 6PM to 10PM (or later). 03-Jun-2006 (Sat): Vegan potluck in Los Angeles (Palms neighborhood) from 6PM to 10PM. 27-May-2006 (Sat): Vegan potluck in North Hollywood from 6PM to 10PM (or later). 06-May-2006 (Sat): Vegan potluck in Manhattan Beach from 6:30PM to 10PM. 22-Apr-2006 (Sat): Vegan potluck in Northridge from 6PM to 10PM (or later). 16-Apr-2006 (Sun): Vegan potluck picnic at Griffith Park in Los Angeles from 12PM to 3PM. 25-Mar-2006 (Sat): Vegan potluck in Northridge from 6PM to 10PM (or later). 18-Mar-2006 (Sat): Vegan potluck in Manhattan Beach from 6:30PM to 10PM. 25-Feb-2006 (Sat): Vegan potluck in Northridge from 6PM to 10PM (or later). 11-Feb-2006 (Sat): Vegan potluck in Los Angeles (Palms neighborhood) from 6PM to 10PM. 28-Jan-2006 (Sat): Vegan potluck in Northridge from 6PM to 10PM (or later). 14-Jan-2006 (Sat): Vegan potluck in Manhattan Beach from 6:30PM to 10PM. 31-Dec-2005 (Sat): New Year welcoming in Northridge from 8PM to 1AM. 25-Dec-2005 (Sun): Vegan potluck in Los Angeles (Palms neighborhood) from 12PM to 4PM. 24-Dec-2005 (Sat): Vegan potluck in Northridge from 6PM to 10PM (or later). 26-Nov-2005 (Sat): Vegan potluck in Northridge from 6PM to 10PM (or later). 24-Nov-2005 (Thu): Vegan Thanksgiving Picnic at Rancho Park from 11AM to 3PM. 05-Nov-2005 (Sat): Vegan potluck in Manhattan Beach from 6:30PM to 10PM. 22-Oct-2005 (Sat): Vegan potluck in Northridge from 6PM to 10PM (or later). 15-Oct-2005 (Sat): Vegan potluck in Los Angeles (Palms neighborhood) from 6PM to 10PM. 24-Sep-2005 (Sat): Vegan potluck in Northridge from 6PM to 10PM (or later). 17-Sep-2005 (Sat): Vegan potluck in Manhattan Beach from 6:30PM to 10PM. 27-Aug-2005 (Sat): Vegan potluck in Northridge from 6PM to 10PM (or later). 13-Aug-2005 (Sat): Vegan potluck in Los Angeles (Palms neighborhood) from 6PM to 10PM (or later). 23-Jul-2005 (Sat): Vegan potluck in Northridge from 6PM to 10PM (or later). 25-Jun-2005 (Sat): Vegan potluck in North Hollywood from 6PM to 10PM. 28-May-2005 (Sat): Vegan potluck in North Hollywood from 6PM to 10PM. 14-May-2005 (Sat): Vegan potluck in Manhattan Beach from 6PM to 10PM. 23-Apr-2005 (Sat): Vegan potluck in Northridge from 6PM to 10PM (or later). 26-Mar-2005 (Sat): Vegan potluck in Northridge from 6PM to 10PM (or later). 05-Mar-2005 (Sat): Vegan Potluck in Los Angeles (Los Feliz neighborhood)from 6PM to 10PM. 26-Feb-2005 (Sat): Vegan potluck in Northridge from 6PM to 10PM (or later). 12-Feb-2005 (Sat): Vegan Potluck in Los Angeles from 6PM to 10PM (or later). 29-Jan-2005 (Sat): Vegan potluck picnic at Griffith Park in Los Angeles from 12PM to 3PM. 22-Jan-2005 (Sat): Vegan potluck in Northridge from 6PM to 10PM. 31-Dec-2004 (Fri): New Year welcoming in Northridge from 8PM to 1AM. 25-Dec-2004 (Sat): Vegan potluck in Northridge from 6PM to 10PM. 18-Dec-2004 (Sat): Vegan potluck in Venice from 6PM to 10PM. 27-Nov-2004 (Sat): Vegan potluck in Northridge from 6PM to 10PM. 25-Nov-2004 (Thu): Vegan Thanksgiving Picnic at Rancho Park from 11AM to 3PM. 20-Nov-2004 (Sat): Vegan potluck in Venice from 6PM to 10PM. 30-Oct-2004 (Sat): Vegan potluck in Venice from 6PM to 10PM. 23-Oct-2004 (Sat): Vegan potluck in Northridge from 6PM to 10PM. 02-Oct-2004 (Sat): Vegan potluck picnic at Venice Boardwalk in Venice from 12PM to 2PM. 25-Sep-2004 (Sat): Vegan Potluck in Northridge from 6PM to 10PM. 18-Sep-2004 (Sat): Vegan potluck in Venice from 6PM to 10PM. 06-Sep-2004 (Mon): Vegan potluck picnic at Point Fermin park in San Pedro from 12PM to 3PM. 28-Aug-2004 (Sat): Vegan potluck in Northridge from 6PM to 10PM. 24-Jul-2004 (Sat): Vegan Potluck in Northridge from 6PM to 10PM. 26-Jun-2004 (Sat): Vegan Potluck in Northridge from 6PM to 10PM. 22-May-2004 (Sat): Vegan Potluck in Northridge from 6PM to 10PM. 24-Apr-2004 (Sat): Vegan Potluck in Northridge from 6PM to 10PM. 17-Apr-2004 (Sat): Vegan Potluck in San Clemente (Orange County) from 6PM to 10PM. 11-Apr-2004 (Sun): Vegan Picnic at the dog beach (Dog Zone) in Long Beach from 2PM to 5PM. 27-Mar-2004 (Sat): Vegan Potluck in Northridge from 6PM to 10PM. 28-Feb-2004 (Sat): Vegan Potluck in Northridge from 6PM to 10PM. 15-Feb-2004 (Sat): Vegan Picnic in La Mirada from 12PM to 4PM. 24-Jan-2004 (Sat): Vegan Potluck in Northridge from 6PM to 10PM. 31-Dec-2003 (Tue): New Year welcoming in Northridge from 8PM to 1AM. 27-Dec-2003 (Sat): Vegan Potluck in Northridge from 6PM to 10PM. 25-Dec-2003 (Wed): Vegan Potluck and Movie in Los Angeles from 12PM to 5PM. 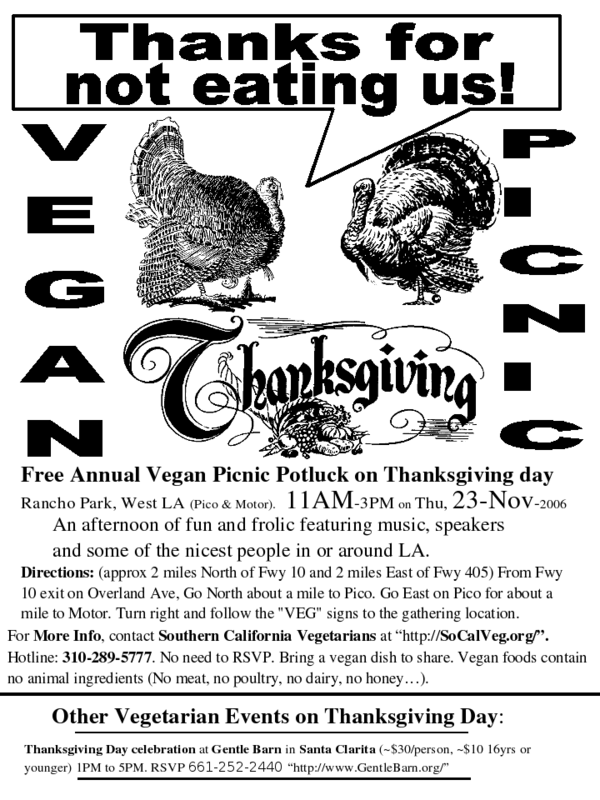 27-Nov-2003 (Thu): Vegan Thanksgiving Picnic at Rancho Park from 11AM to 3PM. 22-Nov-2003 (Sat): Vegan Potluck in Northridge from 6PM to 10PM. 25-Oct-2003 (Sat): Vegan Potluck in Northridge from 6PM to 10PM. 11-Oct-2003 (Sat): Vegan Potluck in Los Angeles from 4PM to 8PM. 27-Sep-2003 (Sat): Vegan Potluck in Northridge from 6PM to 10PM. 23-Aug-2003 (Sat): Vegan Potluck in Northridge from 6PM to 10PM. 02-Aug-2003 (Sat): Vegan Potluck in Los Angeles from 6PM to 10PM. 26-Jul-2003 (Sat): Vegan Potluck in Northridge from 6PM to 10PM. 12-Jul-2003 (Sat): Vegan Potluck and Movie in La Mirada at 4:30PM (Movie around 7:30PM). 28-Jun-2003 (Sat): Vegan Potluck in Northridge from 6PM to 10PM. 24-May-2003 (Sat): Vegan Potluck in Northridge from 6PM to 10PM. 17-May-2003 (Sat): Vegan Picnic Potluck in West Los Angeles from 12PM to 4PM. 26-Apr-2003 (Sat): Vegan Potluck in Northridge from 6PM to 10PM. 22-Mar-2003 (Sat): Vegan Potluck in Northridge from 6PM to 10PM. 22-Feb-2003 (Sat): Vegan Potluck in Northridge from 6PM to 10PM. 15-Jan-2003 (Sat): Vegan Potluck in Los Angeles from 6PM to 10PM. 25-Jan-2003 (Sat): Vegan Potluck in Northridge from 6PM to 10PM. 31-Dec-2002 (Tue): New Year welcoming in Northridge from 8PM to 1AM. 28-Dec-2002 (Sat): Vegan Potluck in Northridge from 6PM to 10PM. 25-Dec-2002 (Wed): Vegan Potluck in Los Angeles from 12PM to 4PM. 28-Nov-2002 (Thu): Vegan Thanksgiving Picnic at Rancho Park from 11AM to 3PM. 23-Nov-2002 (Sat): Vegan Potluck in Northridge at 6PM. 31-Oct-2002 (Thu): Vegan Party on Halloween night in Los Angeles from 7PM to 11PM. 26-Oct-2002 (Sat): Vegan Potluck in Northridge at 6PM. 28-Sep-2002 (Sat): Vegan Potluck in Northridge at 6PM. 21-Sep-2002 (Sat): Vegan Potluck in Los Angeles at 6PM. 24-Aug-2002 (Sat): Vegan Potluck in Northridge at 6PM. 27-Jul-2002 (Sat): Vegan Potluck in Northridge at 6PM. 20-Jul-2002 (Sat): Vegan Potluck in Los Angeles at 6PM. 22-Jun-2002 (Sat): Vegan Potluck in Northridge at 6PM. 25-May-2002 (Sat): Vegan Potluck in Northridge at 6PM. 18-May-2002 (Sat): Vegan Potluck in Los Angeles at 6PM. 27-Apr-2002 (Sat): Vegan Potluck in Northridge at 6PM. 23-Mar-2002 (Sat): Vegan Potluck in Northridge at 6PM. 16-Mar-2002 (Sat): Vegan Potluck in Los Angeles at 6PM. 23-Feb-2002 (Sat): Vegan Potluck in Northridge at 6PM. 02-Feb-2002 (Sat): Vegan Potluck in La Mirada at 6PM. 26-Jan-2002 (Sat): Vegan Potluck in Northridge at 6PM. 12-Jan-2002 (Sat): Vegan Potluck in Los Angeles from 6PM to 10PM. 25-Dec-2001 (Tue): Vegan Potluck in Northridge at 1PM. 08-Dec-2001 (Sat): Vegan Potluck in Los Angeles from 6PM to 10PM. 24-Nov-2001 (Sat): Vegan Potluck in Northridge at 6PM. 22-Nov-2001: Vegan Thanksgiving Picnic at Rancho Park from 11AM to 3PM. 10-Nov-2001 (Sat): Vegan Potluck in La Mirada at 6PM. 27-Oct-2001 (Sat): Vegan Potluck in Northridge at 6PM. 06-Oct-2001 (Sat): Vegan Potluck in Los Angeles from 6PM to 10PM. 22-Sep-2001 (Sat): Vegan Potluck in Northridge at 6PM. 25-Aug-2001 (Sat): Vegan Potluck in Northridge at 5PM. 04-Aug-2001 (Sat): Vegan Potluck in Los Angeles from 6PM to 10PM. 28-Jul-2001 (Sat): Vegan Potluck in Tarzana at 5PM. 23-Jun-2001 (Sat): Vegan Potluck in Northridge at 6PM. 09-Jun-2001 (Sat): Vegan Potluck in La Mirada at 6PM. 26-May-2001 (Sat): Vegan Potluck in Northridge at 6PM. 05-May-2001: Vegan Potluck in Los Angeles from 6PM to 10PM. 28-APR-2001: Vegan Potluck in Northridge at 6PM (Most 4th Saturdays). 24-Mar-2001: Vegan Potluck in Northridge at 6PM (Most 4th Saturdays). 24-Feb-2001: Vegan Potluck in Northridge at 6PM (Most 4th Saturdays). 27-Jan-2001: Vegan Potluck in Los Angeles from 6PM to 10PM. 25-Dec-2000: Vegan Potluck in Los Angeles on Christmas day from 3PM to 7PM. 28-Oct-2000: Vegan Potluck in Northridge at 6PM (Most 4th Saturdays). 23-Sep-2000: Vegan Potluck in Northridge at 6PM (Most 4th Saturdays). 09-Sep-2000: Vegan Potluck in Los Angeles at 6PM. 26-Aug-2000: Vegan Potluck in Northridge at 6PM (Most 4th Saturdays). 12-Aug-2000: Vegan Potluck in Culver City (Los Angeles) at 6PM. 24-Jun-2000: Vegan Potluck in Northridge at 6PM (Most 4th Saturdays). 27-May-2000: Vegan Potluck in Northridge at 6PM (Most 4th Saturdays). 22-Apr-2000: Vegan Potluck in Northridge at 6PM (Most 4th Saturdays). 25-Mar-2000: Vegan Potluck in Northridge at 6PM (Most 4th Saturdays). 26-Feb-2000: Vegan Potluck in Northridge at 6PM (Most 4th Saturdays). 12-Feb-2000: Vegan Potluck in Los Angeles at 6PM. 22-Jan-2000: Vegan Potluck in Northridge at 6PM (Most 4th Saturdays). 25-Dec-1999: Vegan Potluck in Northridge at 6PM (Most 4th Saturdays).